I like to tailor the talks for each specific group. If you are interested in a presentation and/or demo, please give me an idea of the level of academic interest in your group. 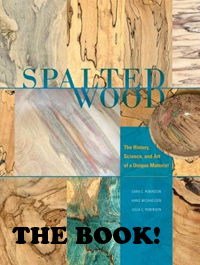 For instance, is your group more interested in the scientific side of spalting, the commercial aspect of spalting, or the hands-on mechanisms of induced spalting? In other words, how much science, how much art, how much craft, and how much technique do you think your group would want? Most presentations / demos are geared for a typical club meeting, so around 2 hours. I am perfectly willing to create longer sessions if requested, especially as longer sessions allow much more information and technique to be communicated.